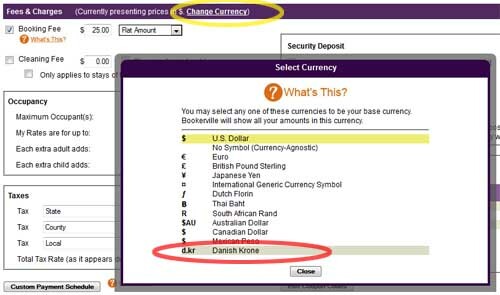 The Danish Krone ("d.kr") is now supported as another currency option you can select. Like all other currency options, this can be different for each property in your account. You can change currency in your Property Setup page. Scroll down to the "Fees and Charges" box and click the "Change Currency" link in the title (yellow circle, above). When changing currencies, be sure to make the necessary changes to your PayPal or merchant account as well. And as always, let us know if you need any help.